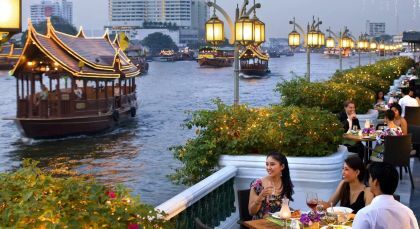 Your Thailand tour begins in the buzzing capital of Bangkok, before you head to the charming north. 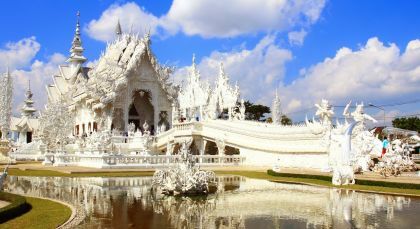 Discover local communities and stunning white temple of Chiang Rai. Venture onward to explore the cultural side of Thailand and discover ancient wonders for yourself! Kanchanaburi town lies 13kms west of Bangkok, bordering north-west Myanmar (Burma). Explore the poignant War Cemetery, the infamous Bridge on the River Kwai and visit the JEATH War Museum that holds artifacts related to the notorious Death Railway, constructed by Prisoners of War in World War 2. Take a train ride up this line through stunning jungle scenery and historic sites to the Nam Tok terminus, where by late afternoon you will reach your accommodation. Drive to Erawan National Park with the jaw-dropping seven-tiered Erawan waterfall dropping down over 1,500m. 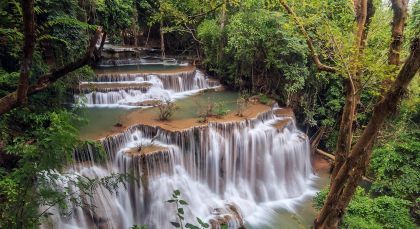 This 550-sq-km park includes the impressive cascading and pooling waterfall that feeds into Mae Nam Khwae Yai. It is said that the uppermost fall appears to resemble the three-headed white elephant of Hindu mythology – Erawan. Weather permitting, you can enjoy a leisurely swim in one of the seven pools created by this beautiful waterfall. Alternatively, take a walk uphill to the seventh tier to truly admire this amazing place. The Historic City of Ayutthaya (also spelled ‘Ayudhya’) or Phra Nakhon Si Ayutthaya founded in 135, is the capital of Thailand’s Ayutthaya province. 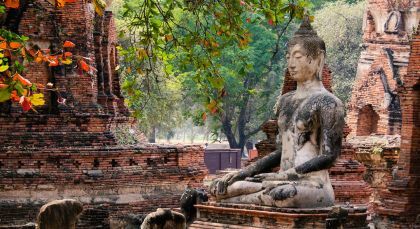 Located 427 km north of Bangkok, Sukhothai, meaning the “dawn of happiness,” is a small city in lower northern Thailand, renowned for the ruins of the ancient city Sukhothai which was the Thai capital during the 13th century. In the late 13th/14th century, Sukhothai was the first capital city of the former Kingdom of Siam. Today it is a UNESCO protected historical park as it exemplifies the glory of original Siamese architecture and houses over 190 ruins related to the first Thai state. 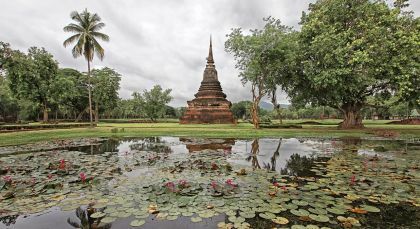 Discover the temple zone, especially the Wat Mathathat, the kingdom’s spiritual center with its prominent yet unique Sukhothai lotus-bud chedi (stupa or Buddhist shrine). The Wat Phra Pai Luang showcases early 13th century Khmer and Lopburi architecture, whilst the Wat Sri Sawai boasts floral stucco reliefs and Lopburi-style ‘apsaras’ (celestial nymphs). Don’t miss the Wat Sri Chum that holds much mystery with its ‘Phra Atjana’ or ‘immovable Buddha’ that stretches 15 meters tall and 11 meters wide! There’s so much to see and do when driving down from Sukhothai to Chiang Mai! En route in Phitsanoloke (about 50 km), you can visit one of Central Thailand’s most beautiful and most important temple, the Wat Mahatat, which lies on the banks of Nan River. 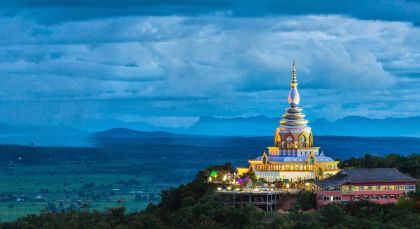 Then, follow the route via the mountains to Lampang, where just a few kilometers away from the city you will stop at Wat Phratat Lampang Luang. Built largely of teak wood, this wat (temple) once contained the famous Emerald Buddha Statue, which is today housed in the Wat Phra Keio. Drive further for another 20 km before reaching Tungvien market, where the inhabitants from the surrounding mountains gather to sell all kinds of exotic animals to eat ..if you have the stomach for it! Then visit Lampuhn city, to see Wat Haripunchai – one of the oldest temples in northern Thailand. Arrive in Chiang Mai, just 30 km away, by late afternoon. 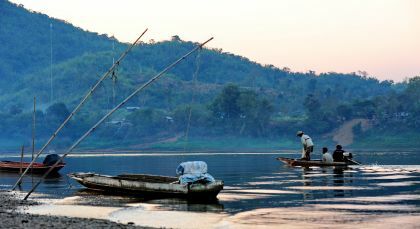 Chiang Khong, a riverside border town in the Chiang Rai Province of Northern Thailand, offers travelers a peaceful getaway from the hustle and bustle of city life. The eco-friendly Lanjia Lodge in Chiang Khong offers the ideal opportunity to acquaint yourself with local life and customs, and relax like a local. Day one: arrive at Lanjia Lodge in the afternoon after lunch. Refresh yourself with locally produced fresh herbal juice while you are checking in at the lodge. Right afterwards, discover the intricacies of life on the Mekong and the local community who depend on the river for their livelihood. Set out on an uphill walk toward a Lahu settlement, where you will observe the everyday life of locals and farmers preparing and setting out for a day at the farmlands. 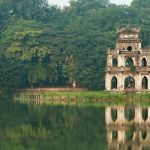 With the river on your right, the trail offers panoramic views of the valleys, and takes you past plantations and fields dotted with tiny settlements. On the way, stop to pay your respects at the verdant Hmong burial ground and continue on to see rice paddies. The trail circles back to your accommodation through the other side of the hill, offering beautiful views of the landscape. Stay overnight at Lanjia Lodge. Day Three: after breakfast, you chauffeur and guide will be waiting to take you to your next destination. (2 Nights/3 Days; Private Activity & Transfer; Fitness Level: Moderate; Please bring comfortable walking shoes). Enchanting Travels was truly an enchanting experience.They are easy to work with and customize the plans per your interest. We made a three weeks trip through South East Asian countries and it was an educational and wonderful experience. We had no troubles during the entire trip and enjoyed all the guides. Lavina, our Trip Coordinator, and Ranjana, our Travel Consultant, were great to work with. Go with Enchanting with no hesitation.